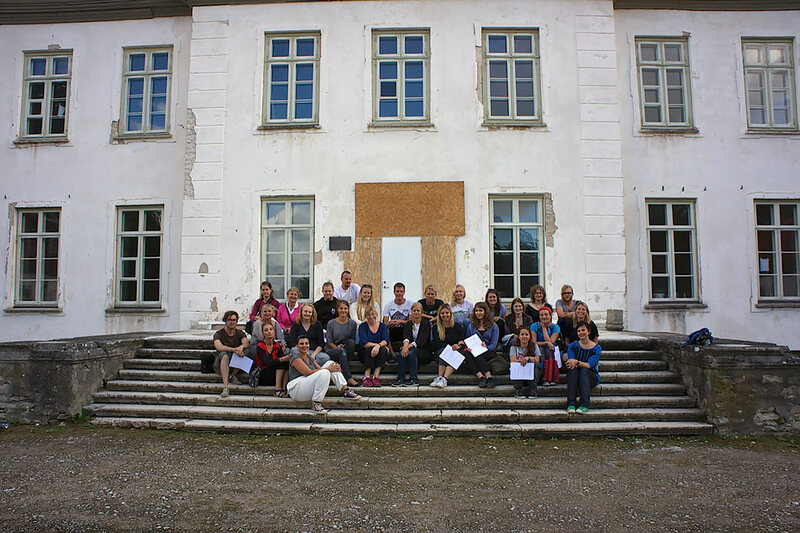 International Sustainable Heritage workshop Conservation of Wall Paintings with participants from the Estonian Academy of Arts, Tartu Art College, Vocational School of Hiiumaa (Estonia), Novia University of Applied Sciences (Finland), and Uppsala University Campus Gotland (Sweden), August 24–30, 2015 at Suuremõisa manor on Hiiumaa, Estonia — the objective: acquisition of practical skills through hands–on work and international cooperation. Suuremõisa is one of the grandest baroque manor ensembles in Estonia. The history of the estate can be traced back to the 16th century or earlier. The current building was erected in 1755–60 probably on top the remains of an older building by the Stenbock family. The architect is thought to have been Joseph Gabriel Destain. In 1772, the main building was extended with two one–floor wings and a ceremonial courtyard. Inspiration for the architecture, notably the hipped mansard roof and the two wings, came from Ulriksdal Palace in Sweden. The building ensemble still displays some of the original details, such as the fine carved baroque main door, lime rendering on the facades, not to mention the original windows. Many panels and mouldings, staircase, doors, ceiling paintings etc. inside the mansion date to the 18th century aswell. The manor has belonged to several well-known members of Swedish and Baltic German nobility. One of the most infamous and colourful landlords was Otto Reinhold Ludwig von Ungern–Sternberg (1744–1811) who was sent to Siberia in 1804 as a punishment for murdering a Swedish skipper. His extraordinary life has inspired literary works as well as local lore. 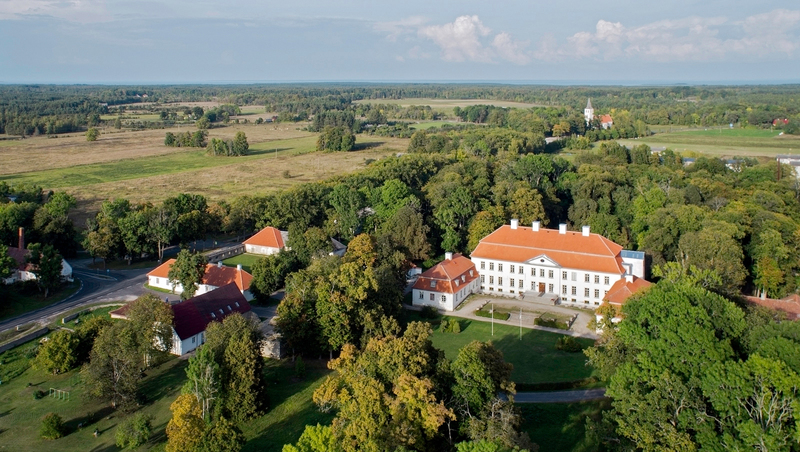 Today the manor in Suuremõisa is home to Hiiumaa Vocational School and Suuremõisa Elementary School. Renovation works at the main building started in September 2014. Students attending the Sustainable Heritage Intensive Course took part in these works a year later to learn about the crafts and materials involved in a building project of this kind and scale. 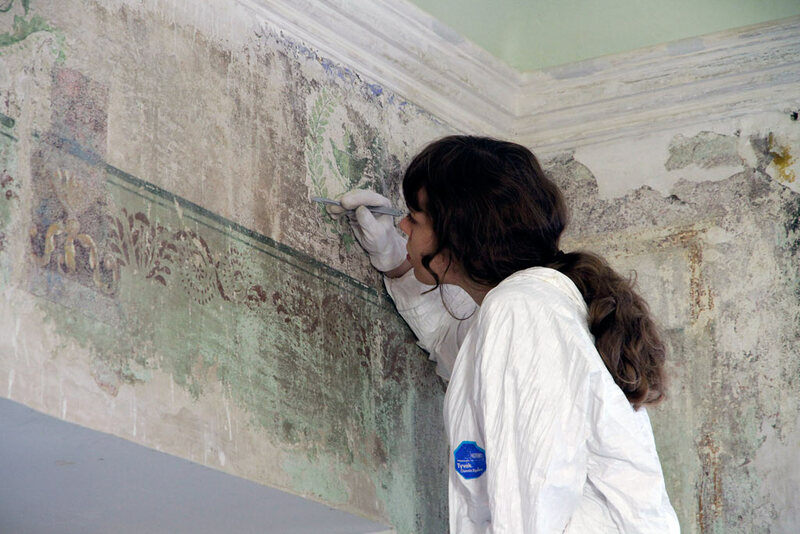 The students contributed to the conservation of wall paintings in two rooms on the first floor of the building. 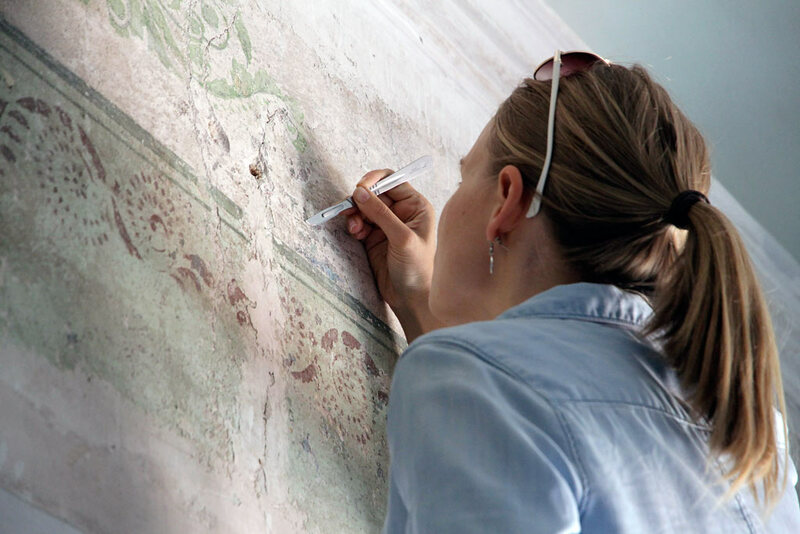 The early layers of the murals were thoroughly investigated by students under the professional guidance of Hikka Hiiop, Merike Kallas of Estonian Academy of Arts and Heli Tuksam of Tartu Art School. Based on the results, the concept and methods for preservation were then established and put into practice on sample areas. The original decor is naturally of great historic value .The aim is to preserve these interiors. 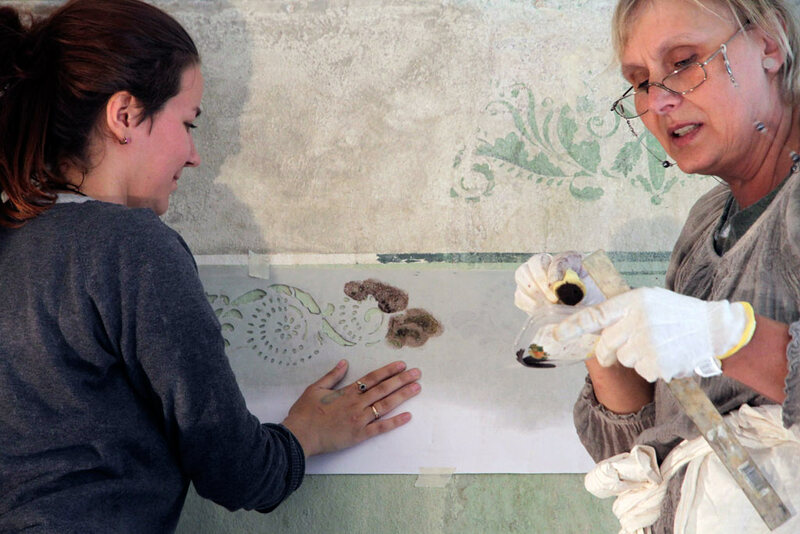 Good samples of the paintings were exposed and their current condition was conserved. The Sustainable Heritage course lasted only for one week. Yet, the sustainability of the project is ensured by the students and tutors of Hiiumaa Vocational School who will complete the conservation works within the framework of their studies. 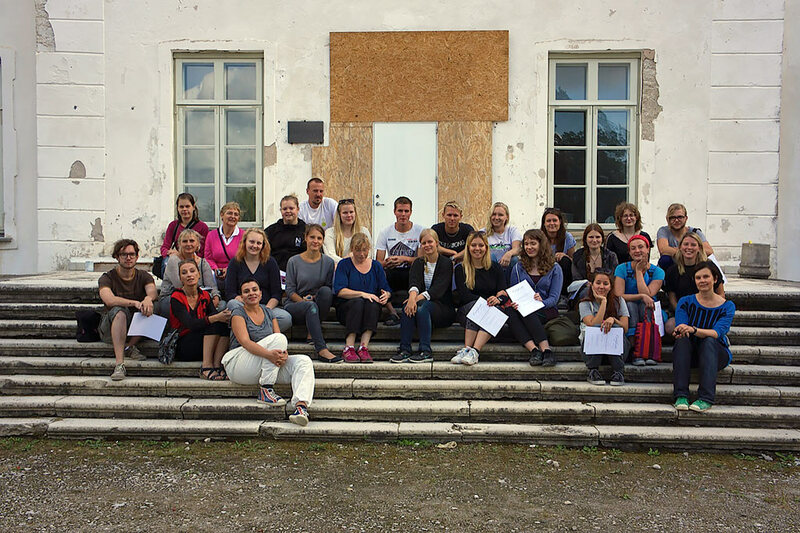 Once again students from Estonia, Sweden and Finland were offered a unique learning experience organised by Maris Veermäe, Estonian Academy of Arts. The days were filled with interesting conservation work and excursions to the sights of beautiful Hiiumaa. Photos by Viktor Källgren, Maris Veeremäe and Towe Andersson.